A standing ovation greeted the four principals on the closing night of this revival of Ernani, and apart from anything else it served to underline just how well the Met had served Verdi in casting the parts with big dramatic voices. And as a regular attendee of Covent Garden, it was interesting to see that the musical standard of the Met's performance was much finer and more exciting than various recent Royal Opera Verdi performances, even for a revival of a decades-old production. Admittedly Pier Luigi Samaritani's sets, which were new in 1983, do little to make sense of Piave's rather eccentric libretto based on Victor Hugo's play, especially in the slightly risible mountain scene at the start of the first act. 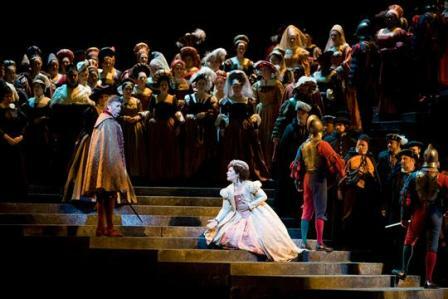 But most of them have a grandeur which provided an excellent backdrop for the strong singing and acting on offer here. The huge painting for Elvira's apartment drew applause from an appreciative Met audience, and the imposing stone staircase for Silva's castle in Act II was a perfect vehicle for the high-voltage action of the scene. Peter J. Hall's costumes look as opulent as ever, and though the moonscape backdrop for the final act is rather laughable, Gil Wechsler's lighting serves the singers well on the whole (occasionally their faces could have benefited from clearer illumination, however). If the effect of the whole thing was unashamedly old-fashioned and the individual direction a little vague, it was a reminder of how exciting opera can be when the singers are given room to access the emotions of a score rather than being distracted by a pretentious concept. Dramatic rather than bel canto voices gave Verdi's early opera a sharp edge, so although all four principals fluffed some of the Donizettian fioriture, the sheer visceral force of their sound put the odd fault into the background. The four soloists were so well balanced that they kept spurring each other on to even greater things: thrills rather than refinement characterised the performance, and at times I was pinned to the back of my seat. 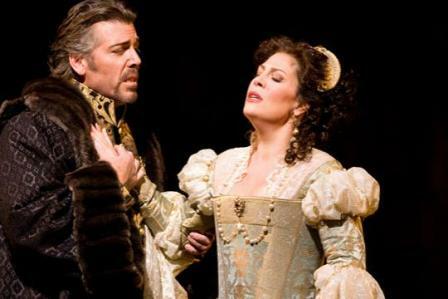 Though some people feel his voice isn't suited to Verdi, Thomas Hampson nearly always seems at his best in this repertoire as far as I'm concerned. He made a glorious Don Carlo here, mixing a gorgeous lyric talent with a Lied singer's intelligence and an aristocratic demeanour. In an evening of vocal highs, his rendition of the third-act aria 'O de' verd'anni miei' was perhaps the apex. Still, his colleagues were also excellent (and better than some of the opening-night reviews I had read lead me to believe). Sondra Radvanovsky is a hugely committed artist whose sense of text and strong projection are ideal for Verdi. An affecting actress, Radvanovsky ensured that although Elvira is thrown from one man to the next, she remained an active character, and I was impressed at her ability to ride the orchestra and chorus during the concertati. 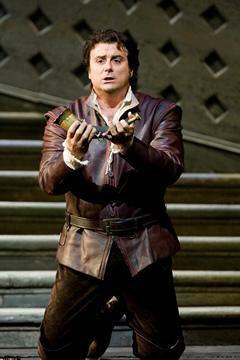 Ferruccio Furlanetto – soon to be Covent Garden's Philip II in the new Don Carlo – had perhaps the biggest stage presence and voice of the four lead singers, bursting into the trio in Act I, Scene II with arresting vigour as a scheming and tortured Silva. Marcello Giordani showed his customary full Italianate tone in the title role; if occasionally he seemed a little overwhelmed in the ensembles, his barn-storming, ear-ringing rendition of the stretta to the second act brought the house down. The smaller roles were all well taken, with Keith Miller's Jago and Wendy White's Giovanna showing an admirable consistency of stylish singing with their starry colleagues. Roberto Abbado conducted with passion and drive. Occasionally, a clearer beat and slightly faster (in the case of some of the gentle parlante passages) or slower (in the case of the taxing coloratura passages) would have increased the accuracy of the playing and singing. But the orchestra played with a glorious tone, sensitive balance – both with each other and with the singers – and a sense of the composer's use of chiaroscuro, especially in the opening pages of the second act. The off-stage banda was admirably clear and accurate, too. In sum, then, if Samaritani's production looks its age, the excitement and sparkle of the vocal performances made for a memorable evening.